We pretty much had an error free session last night. Everything went relatively smoothly, with only a few extremely minor issues, all very easily updated in the latest v2.25 fix. And although we only had a play time recorded of 1 hour 7 minutes, this was mainly due to one player having to be called away for half an hour (combat was in TB pause mode anyway) and we did a fair share of paused TB combat, which does not record time. Strictly speaking, there was only one fix that needed addressing, which is explained below, and the rest of the alterations are to do with tweaking/balancing, or updates to do with the TB Combat system, all explained below. 1) JOURNAL TB PAUSE: This only affects players using the auto-pause TB Combat System. If, while paused, the player views their journal and looks at a creature entry from the bestiary, the game requires a very brief (0.1 sec) unpause to allow the GUI to update. If the game is paused, the system needed to be updated to ensure the game paused after this update, or else the round would play for the six seconds before pausing again. 2) CURE MINOR WOUNDS TLK ENTRY: The description Cure Minor Wounds spell was incorrect. I have made the cantrip now cure between 1-4 HPs and not 4, as the description said. The latest TLK file addresses the description entry. 3) OTHER (MINOR): A TYPO in the TIME WARP rule description. Target GUI auto open for the DM too. 2) GUARD SEARCH: Again, after some player feedback, I decided to alter the algorithm related to the guards that may try to search PCs for stolen goods. The search now depends upon if stolen goods have been reported, and a reduced random chance search roll. 3) CREATURE CR FEEDBACK: When encountering a creature, the PCs are given an indication of how tough an adversary may be (a Challenge Rating or CR) according to the heroes own levels. I have altered the algorithm, as the encounters were giving a CR feedback slightly too high for the creature encountered. i.e. A creature may have been labelled "HARD" instead of "NORMAL". The algorithm governing this may have other slight tweaks if needed, but as it is only a guide, further alterations may not be required. 4) TB PAUSE FUNCTIONS: For those that use the Althéa auto-pause TB Combat System, there has now been an additional 0.5 second "move forward" option added to the SHOW GUI (small square in the top left corner). To activate the 0.5 second forward time, the player now RIGHT-CLICKS in the box. Doing so will move combat forward by 0.5 seconds with each additional right-click. This allows the player to determine if their PCs are doing what they want to in a round, or take additional reactionary steps within the round in question. E.g. 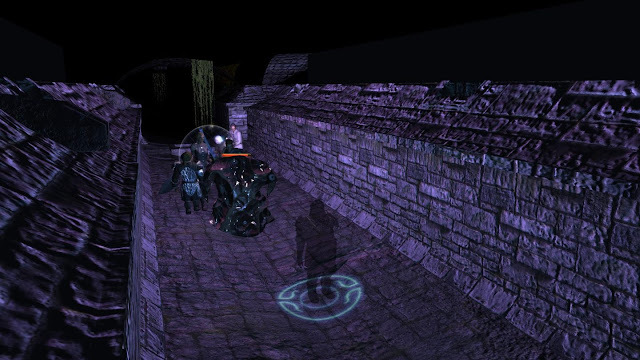 The 0.5 second is used and the player notices a creature move somewhere they had not expected, the player may then change the current action of their PC or PCs to accommodate it. This is in addition to the 0.1 second "move forward" that the player can use by simply entering the small GUI at the top left of the page. NB: In a MP game, only the leader can now do the 0.1 step, but all are still able to right-click for 0.5 sec. B) Request of other players that the party stop and rest (pass time) to allow player 1 to have enough time to recover the spells that they have lost. If agreed, then TIME must be made to pass before the final result of that REST can be applied using the REST function to recover spells and HPs. 2) ... AND TIME AGAIN! THE VIGOUR SYSTEM: In relation to time is the need to rest and recover due to fatigue and exhaustion (and not just for spells and HPs). The rules behind these conditions are fairly varied (as a variant rule) and can appear harsh to the unaware player. However, The Scroll has implemented its own version of the variant rule, which is more generous to the PCs. FORCED MARCH: In a day of normal walking, a character walks for 8 hours. The rest of the daylight time is spent making and breaking camp, resting, and eating. A character can walk for more than 8 hours in a day by making a forced march. For each hour of marching beyond 8 hours, a Constitution check (DC 10, +2 per extra hour) is required. If the check fails, the character takes 1d6 points of non-lethal damage. A character who takes any non-lethal damage from a forced march becomes fatigued. Eliminating the non-lethal damage also eliminates the fatigue. It’s possible for a character to march into unconsciousness by pushing himself too hard. In The Scroll, however, a system is put in place to indicate when an adventurer has been on their feet for more than 8 hours, in that they begin to suffer from lower vigour than they had at the start of a day. The more their vigour score drops through continued adventuring (and not resting), the more they begin to suffer from fatigue and exhaustion. The most a PC can suffer in The Scroll is -3 to strength and -3 dexterity and slower movement (when famished). If they push themselves without eating beyond this, then they also suffer further penalties to attack and damage due to hunger. The PC does not need to make a constitution check, as HPs are NOT removed in this system. Furthermore, the heroes never fall unconscious as a result, no matter how sorry a state they become. NB: It is also worth noting that just because one PC has a higher constitution than another, these detrimental effects due to fatigue and exhaustion are personal and relative. i.e. A fighter with 18 strength may drop to 15 if they go without rest and food, but this is still very strong compared to an accompanying wizard who may have started with 10 strength and has now dropped to 7. The Adventure Continues ... 9. It's Dirty Work! Didn't we just come this way? The heroes started to feel the pressure of being on their feet all day again, and so Myara suggested they all get some rest at the Bloated Buckle Inn before tackling the sewers. The heroes were now quite competent at grabbing sleep wherever they could find it, and so even a cheap night at the inn gave them a good rest, and fully prepared them for what lay ahead. Myara noticed a nearby chest and grabbed some torches that were inside, as Helden spotted some nearby wall mounted torches and lit them. The small round chamber they found themselves in was almost welcoming in the new light of the torches, but the terrible stench that started to waft from a nearby passage told them quite distinctly that this job was a dirty one! 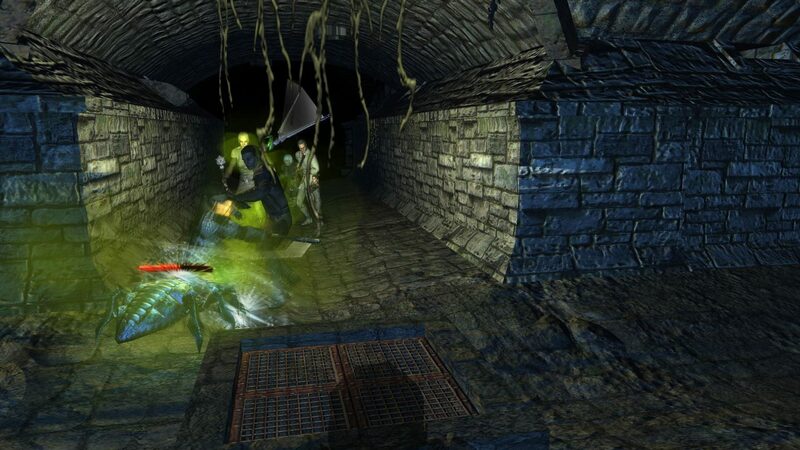 Helden had hardly started leading the band of heroes down the first passage when they encountered what was to be a fairly common encounter down here: a sewer beetle! It had been a a day or two since the party last saw any combat, and the approaching sewer beetle appeared quite menacing, even spraying acid at the heroes at its approach. However, with Helden's quick reactions, and Myara's bow shot, the oversized, acid spitting vermin was quickly taken down. It was not long before Helden was scratching around its remains, harvesting items than may be of some use, especially in alchemy. After some minor healing from the clerics, the heroes continued to push north through the tunnels, one time with Helden losing his bearings in the maze of the sewers ... even with his otherwise immaculate mapping skills. Eventually, the heroes came to what appeared to be a natural divide, a chamber with a bridge that covered a large run of waste water. Myara noticed a body, and took note that she wanted to investigate it, but for now, Helden, acting as the party leader chose to take the group back to map the rest of the chamber south of the divide. As the heroes made their way around, they noticed piles of junk caught up here and there, and often searched them in the hopes of finding anything useful. Apart from the odd useful herb or bullets, not much else was found though. As the group followed the passage south again, they came across another circular chamber. This one had a few oil barrels and a large table where they could make repairs to weapons if needed. Moving further east from the chamber, the heroes followed a passage that appeared to move to another region of the sewers. As they slowly made their way, searching all the while, a strange noise began to sound ahead, and before they knew it, some of the party started to become confused by its strange influence. "It's a Gibbering Mouther!" shouted Helden, but half the party were just standing around doing nothing, confounded by it's supernatural sound. Quickly Helden took stand to defend the group, and eventually, as the effect of the strange sound wore off, the rest of the party took up a defensive stance and joined the battle. The battle was far from easy, and considerably more difficult than a few oversized sewer beetles they had encountered up to now. Helden even noticed that his own magikal weapon was having a minimal impact against this hideous monster and its strange pulsating "skin". More than once, Elana and Threska had to apply their healing to the two fighters that held the creature at bay, while Myara bowed it from behind the fighters. Creatures were summoned and magic missiles cast, but the emanating sound of the creature stopped the summoned creatures in their tracks, and it was obvious that it would take a lot more beating than the spells used so far. Eventually, with Karatsen exhausted of spells, and the clerics running low on healing, the creature finally succumbed to the blows of Helden and Flint, and the arrows of Myara. Again, Helden searched the remains, and found some useful alchemical essences. However, this battle used a lot of the party's resources, and Helden was not happy about moving forward without spell backup. Although not in the least tired, he made the decision that the party should head back to the first sewer chamber and make camp there and rest to recover spells before resuming their search. So, the adventurers slowly backtracked, and setup camp in the first chamber, putting their ability to rest in almost any environment very much to the test. The spell casters put themselves into a Trance, and used the Cocoon spell where required, and eventually the 12 hours of time required to rest and relearn spells and prayers passed. It was now around 5.00 pm, and the heroes had prepared themselves for the night shift of dirty work. TOTAL SESSION TIME (UNPAUSED): 1 Hr 7 Minutes. GAME TIME SINCE START: 12 Hours 29 Minutes.